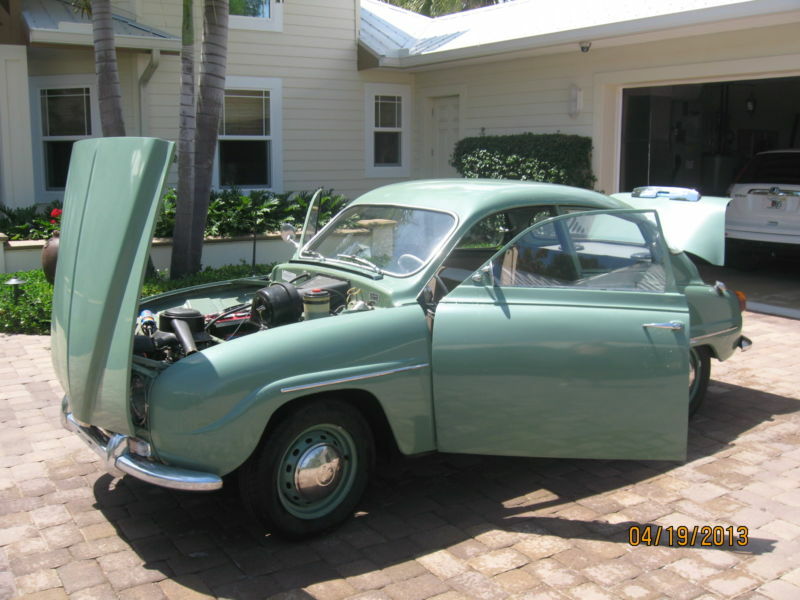 The SAAB 96 was introduced in 1960 as a front drive streamlined styled descendant of the UrSAAB. Proper capitalizing all of the letters in SAAB is well...proper...because it's actually an acronym, standing for Svenska Aeroplan Aktiebolaget which translates to Swedish Aeroplane Ltd. The early cars definitely had an aeronautical aura about them with blunt front, clean fuselages and teardrop tails. 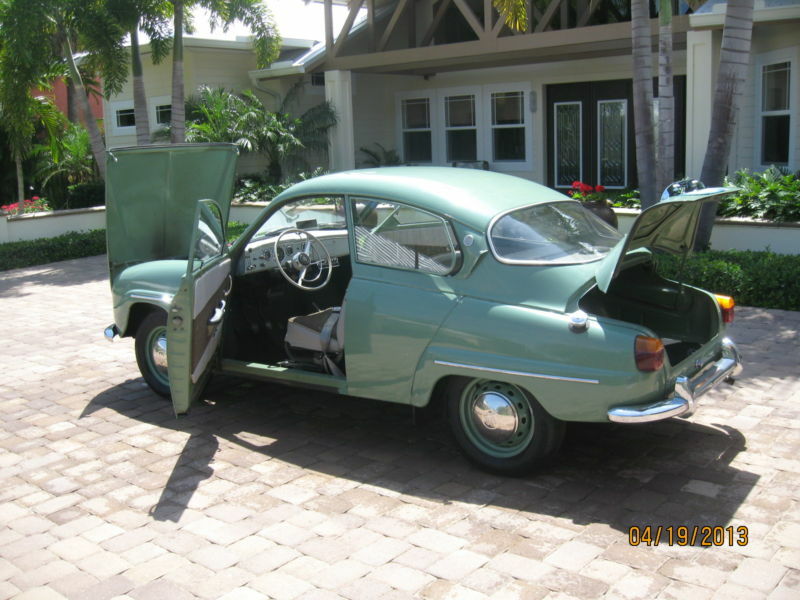 Find this 1966 SAAB 96 2-stroke for sale in Merritt Island, FL currently bidding at $3,140 reserve-not-met on ebay with a buy-it-now of $6,500 with 1 day to go. Update: This was submitted as a tip during the 50 car madness last week and commenter JPB is offering to test drive/inspect this car if necessary. See comment below. The SAAB 96 is powered by a 2-stroke 841cc 3-cylinder engine that puts out 46 horsepower into a 3 speed manual transmission with freewheel overrunning clutch. This clutch allows the engine revvs to drop when coasting downhill because the two-stroke engine needs the premixed oil in the gas tank to maintain proper lubrication and coasting downhill it would not get enough oil at high revvs. This can be a bit of a surprise to a driver expecting typical engine braking, but otherwise it runs/drives like anything else two-stroke powered from the 1960s. ~ the winning bid was $5,800 before seller and buyer came to an impasse when listed previously. i'm of the opinion it is well worth that sort of price given the scarcity of SAAB 96 examples this nice. these were a favorite of my brother, Dean. Scot- I totally agree. This is a last year 2-stroke and its an appropriately Saab color combo for anyone looking for a ring-ding-ding-ding-dinging freewheeler. With it being in FL,the last straw may have been transportation costs. There's a deal to be struck for someone on the east coast. ~ i just recalled this SAAB 95 V4 which brought $40,700 at Gooding, Scotsdale in January. makes this unit quite a bargain for an actual driver. Thanks for the link Scot, that's some wagon!! I've always wondered if your average small-engine mechanic could work on one of these. Can it be much more exotic than a large 2-stroke dirt-bike engine? Greetings: I submitted this during the 50 car anniversaryathon.I live the next town over and have seen this car on the road once -a few months ago. Willing to view if needed. These cars had a 4-speed manual transmission with column mounted gear change. Earlier cars were 3-speed.